Frederick Ambrose Clark (1881-1964) was born to immense wealth and privilege. He was not ashamed of this, nor of his determination to live his life in pursuit of the things he most enjoyed. He did not go into business, or even, for that matter, finish college. 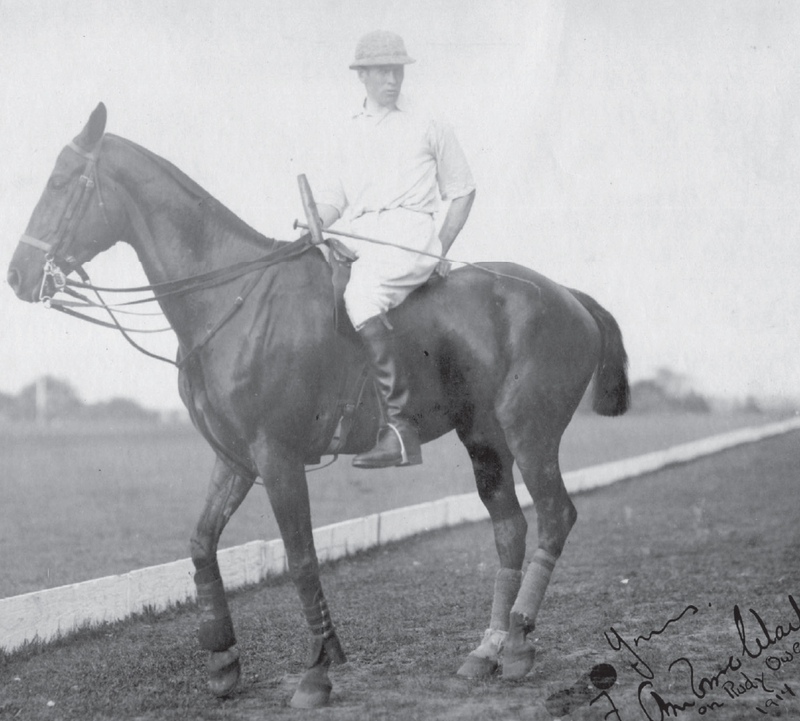 “Brose,” as he was known to his friends and family, rode to hounds, played polo, competed in showjumping competitions and steeplechases, and drove an immaculately turned out four-in-hand around Aiken and his properties in New York. He was a big man and a bold rider, but not necessarily a good one. In fact, descriptions of his riding almost invariably include accounts of his many falls. According to his obituary, by the time he was an old man, he had broken every bone in his body at least once. The fall that put an end to most of his riding happened when he was about 70 years old. He was at Broad Hollow, his 500-acre estate in Old Westbury, Long Island, riding one horse while leading another, a yearling racehorse prospect. Something spooked the yearling, which pulled Mr. Clark from the saddle, knocking him to the ground where he fractured his left hip. Still, he wouldn’t let go of the young horse. “Damned valuable yearling,” he said later. Before consenting to get into the ambulance to go to the hospital, he is said to have asked for a blanket, a box of cigars, and a magnum of Champagne. The Clark fortune, made in the 1800s, came from a partnership between Edward Clark, who was Ambrose’s grandfather, and Isaac Singer, who invented the Singer sewing machine. The elder Clark was a lawyer who first got involved with Singer during a patent dispute. His pay was a one-third portion of the sewing machine patent. Later, Clark became a full partner in the business, which relied upon Singer’s inventive talents and Clark’s brilliant business acumen. By 1860, Singer was the largest manufacturer of sewing machines in the world, and Clark was a millionaire many times over. He also invested in real estate and built the Dakota, which was one of the first luxury apartment buildings in Manhattan and remains a prestigious address. F. Ambrose Clark was born in Cooperstown, New York, where his family had a vast country estate. Horses were his life from the beginning. In addition to his own athletic pursuits, he also owned and bred racehorses. In September 1902, when he was 21, he married Florence Lockwood Stokes, the youngest daughter of Henry Stokes, who owned the Manhattan Life Insurance Company. Their wedding was attended by 100 family and friends. The wedding cake, shaped like a horseshoe, was sprinkled with 100 solid gold horseshoe nails that guests took home as souvenirs of the occasion. Florence (known as Meg) was both an heiress and an avid horsewoman and racing enthusiast in her own right. In fact, she maintained her own racing and breeding operation separate from her husband’s. Her older sister Marie, also an enthusiastic horsewoman, was married to Albert C. Bostwick. Marie’s sons Dunbar and George Herbert (Pete) both got their start in horse racing by working for their uncle Ambrose. Pete Bostwick, who was inducted into the United States Polo Hall of Fame, The National Racing Hall of Fame and the Aiken Racing Hall of Fame, used to ride Brose’s horses in both flat and steeplechase races. These races included the top contests in the sport – for example, in 1928, Pete finished fourth in the Belmont Stakes, riding Ambrose’s Whisk Broom. The Clarks did not limit their sporting pursuits to the North American continent. They also had a country estate in Melton Mowbry, England, where they regularly went foxhunting. There, they often rode with the Prince of Wales, who later became the Duke of Windsor after abdicating the British throne to marry Wallis Simpson, an American divorcee. In England, the Clarks maintained stables of flat and steeplechase horses, and could claim the distinction of being among just a handful of American owners whose horses have won the English Grand National. The Grand National is the most prestigious contest in steeplechasing, famous for the height of its fences and for the fierceness of its competition. In 1933, Ambrose had two horses entered in the race, Chadd’s Ford and Kellsboro Jack. Believing himself to be a jinx on his horses that year, he sold Kellsboro Jack to his wife for one pound just before the race. Chadd’s Ford finished second to last. Kellsboro Jack sailed home the winner by three lengths. After the race, Meg magnanimously allowed Ambrose to parade her new champion to the winners’ circle. In 1915, after German U-boats torpedoed and sank the RMS Lusitania off the southern coast of Ireland, the Clarks, like many of their set, decided to spend their winters in the U.S. rather than venturing overseas. In 1916, they joined a growing number of “Winter Tourists” who regularly came to Aiken for the winter months. For several years, the Clarks rented winter “cottages” for their Aiken sojourns, often staying at William C. Whitney’s opulent Joye Cottage on the corner of Whiskey Road and Easy Street. In 1929, they purchased their own estate, Habersham House, which was built two years earlier for Kenneth Schley, the Master of the Essex Hunt. After the Grand National victory, Habersham House was renamed Kellsboro House in the horse’s honor. Ambrose also built himself a distinctive brick stable in Aiken just across Mead Avenue from Whitney Polo Field. Known as the Clark Barn, the stable, complete with an indoor track, is said to have won an architectural award after it was built, but actual records of this are difficult to locate. In any case, the stable, which today stands beside Winthrop Polo Field and across from the Track Kitchen, was recently restored by Larlee Construction for its owners, Sandy and Don Nicolaisen, and this January won a Stewardship Award from the Historic Aiken Foundation. F. Ambrose Clark’s love of horses extended to all disciplines and encompassed sporting art as well as flesh and blood horses. Broad Hollow, a 42-room mansion he purchased from Thomas Hitchcock, housed an impressive collection of paintings: “A month with every reference book on sporting art would be necessary to do credit to the gems in the collection,” wrote Harry Worcester Smith, the author of Life and Sport in Aiken. An appreciation for art ran in the family: Ambrose’s brother, Robert Sterling Clark, was one of America’s foremost collectors of Impressionist paintings, while his brother Stephen Carlton Clark, also an art collector, was on the board of directors of both the Museum of Modern Art and the Metropolitan Museum of Art. Stephen was also the founder of the National Baseball Hall of Fame near the family seat in Cooperstown. Throughout his life, Brose was known for his passion, not just for horses, but also for good living and for a certain stubborn affinity for the past. With his elegantly tailored suits, fancy waistcoats and bowler hats, he is said to have always looked like he just stepped out of a 19th century sporting print. He loved Champagne – he even had it for breakfast. He hated automobiles, and insisted on driving his coach and four wherever he could. When he had to take a car, it was a Rolls Royce created especially for him with a bed in the back. 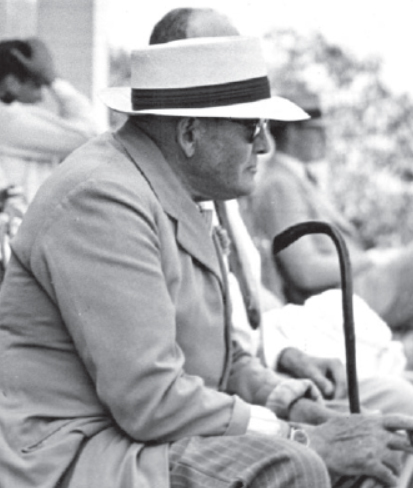 For 15 years he hosted the Meadowbrook Cup, a timber race, at Broad Hollow. He refused to allow NBC sports to drive onto the property and insisted that they transfer their radio equipment to a farm cart in order to cover the race. Above everything, perhaps, Ambrose Clark had a love for animals – not just for horses but for dogs as well. In the book The Clarks of Cooperstown, written by Nicholas Fox Weber, his great niece, Anne Peretz, remembers having breakfast with him at the estate in Cooperstown when she was about 7. She would sit at one end of the table with her great uncle at the other. Six high-backed chairs, three to each side, were arranged along the table. At a signal, Brose’s six Springer Spaniels would hop into the chairs and wait while the butler served them bowls of food. The dogs sat motionless while Ambrose said grace, and then ate with enthusiasm as soon as they heard the word Amen. Many accounts of Ambrose’s life say that he and Meg had no children. This is not true, however. In 1910, they had a daughter named Ethel, who had some kind of physical and mental disability. Ethel is rarely mentioned, although when she was 18 she did accompany her parents to Melton Mowbry, according to a brief mention in the New York Times. She lived in her own home on the Clark’s huge property in Cooperstown, where she was attended by servants until she died in 1932. During World War II, the Clarks established a rest camp for Navy seamen in her memory. In his later years, Ambrose suffered from the falls he took early in his life – little wonder as he is said to have had his spine held together by a number of silver pins. Alan Corey III, a longtime Aiken resident, remembers seeing him on a horse, but recalls that he always looked as if he was propped up there. Both Alan and Ambrose’s great nephew Charlie Bostwick remember him better driving his four-in-hand coach around Aiken’s dirt roads. Despite his increasing ailments, Clark maintained his racing stable until October 1963, when, not feeling able to “enjoy the fun”, he disbanded it. He died the following February at the age of 83.